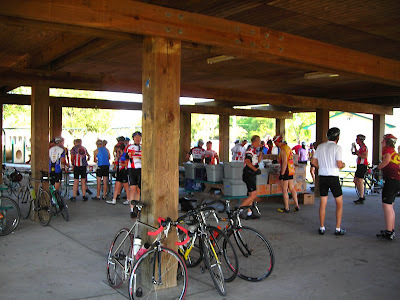 Russ Bogue of the Tampa Bay Freewheelers sent me some nice photos from Sunday's big Strawberry Ride in the Plant City area. 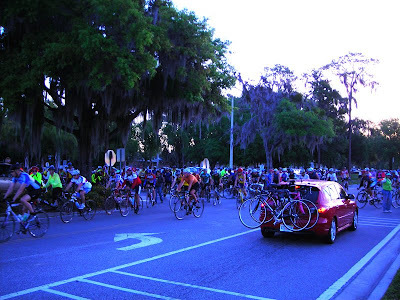 Bike Florida runs an annual long-distance bike ride for a week through a section of Florida. This year's Bike Florida ride begins in Clearwater and will use trails such as the Pinellas Trail, Suncoast Trail and Withlacoochee Trail as part of its route. 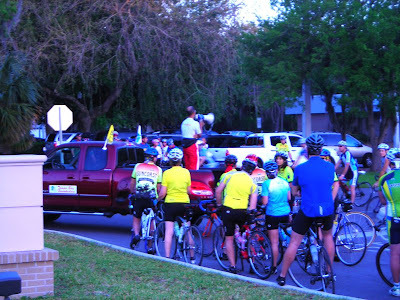 The Bike Florida cyclists started arriving Sunday for the start in Clearwater. 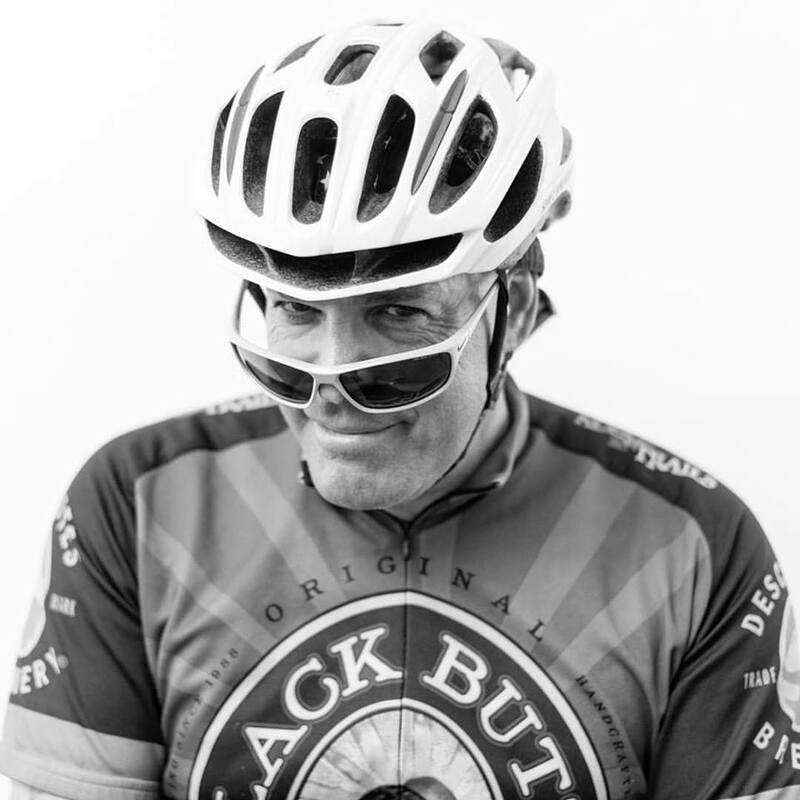 My neighbor, Eddie, will be be along for the route as a massage therapist. I'm sorry I couldn't bike the Big Strawberry today, but late in the day I took a spin and stopped by Roberta -- Lake Roberta, that is. Strawberry Ride cyclists are invited to send their photos to Bicycle Stories and I'll post some of the best. This Strawberry ride photo was sent in last year. Today I logged 80 miles on the bike pedaling out to St. Petersburg from Tampa, then biking through St. Pete to the paved trail that takes you out to the skyway pier. Here is a spanking new paved path along Gandy Avenue that takes folks out to the Gandy Bridge and the Frindship Trail. I biked with my bicycling chum Ellen, who is in training for the Police Unity Tour, a law enforcement memorial fund-raiser ride that ends in Washington, D.C. Ellen is organizing a local Police Unity Tour fundraising event at Hattricks bar in downtown Tampa on April 10. I was astonished at how picturesque and accessible the paved path that you can take out to the Skyway park and pier. We biked for a solid five miles on the path, so it's a tidy 10-mile roundtrip just on the skyway trail. If you get the chance, I'd suggest a bike ride on the paved trail. You get great views of the skyway bridge. Ellen is biking in the state park part of the pier -- and it actually cost us $2 just to bike for about a half-mile and be in "the park" for 5 minutes. A car costs $3. The Skyway -- a helluva bridge. Here's Ellen --a terrific friend and good cyclist. She's the local force behind the local contingent of law enforcement cyclists who ride the Police Unity Tour. One of the most lovely natural gems in Florida is a small mangrove-filled state nature preserve off the Intracoastal on the Atlantic Ocean side of the state called Jack Island State Preserve. I wrote a Travel story for the South Florida Sun-Sentinel in Fort Lauderdale that I wanted to share with you folks. You can take a mountain bike or even a hybrid bike with decent wide tires and bike the trails at this nature haven. Today a whole bunch of baseball fans said so long to historic Al Lang Field in St. Petersburg for one last time. It was the last home game for the Rays at their spring training stadium because next year the local ballclub is off to Port Charlotte starting next spring. Remarkably, more than a half-dozen teams held spring training at the field, including the New York Mets and their famed 1969 World Championship team. After today's last game, the Rays invited the fans to come on the field, munch some free hot dogs and snap photos to their hearts' content all around the joint. The Rays hope the local fans in St. Petersburg will go to the polls and approve a new regular stadium on the bayfront site of the Al Lang ballyard. In fact, the photo above shows where home plate would be if the new stadium was built. Just below, you're looking at the final out and the final play at Al Lang Field -- a ground ball off the bat of a young Rays player by the name of Jay Canizaro. After the last out of the last game, Rays Managar Joe Winecork held court on the field for one final time. You're looking at the last lineup at Al Lang Field. Anyone with a camera on the field after the game had a field day. Folks lounged all around the field, ate hot dogs and created a fun scene, such as three of my friends -- Ellen, Nancy and Carrie. Once the gates were open for fans to feel the field, there were a few bicyclists in the bunch. Some older "kids" also ran the bases after the game. Right before the last out was made at Al lang Field, this little fella was sound asleep. The Cowbell guy and Minny Cowbell guy were making the rounds. Raymond the mascot was popular after the game. This gal laid back and enjoyed a nice smoke in rightfield. There's Mayor Ballpark at the last game. Today I journeyed to Polk County to catch the final Cleveland Indians game at Chain of Lakes Park in Winter Haven, then bike a little on an old route down Scenic Route 17 along the north-south Lake Wales ridge. After catching the action at the ol' ballyard, I drove to a parking lot in nearby Dundee by a Winn-Dixie supermarket. In the corner of my eye I saw a bicyclist on the sidewalk in front of the Dundee Library, which rents space in the shopping center. Rachel VanSlyke was on Day 4 of an amazing 4,000-mile bicycle journey from Davie, Fla. outside Fort Lauderdale to Montreal. 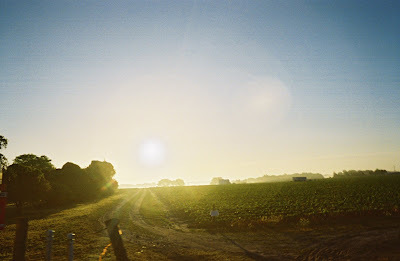 She's a 25-year-old singer who cut a CD last year in LA called so I begin and was, thus, on the so I begin bicycle tour, with about 30 singing stops along the way. Rachel says her singing style is comparable to Sheryl Crow, kind of a hybrid of rock, folk, country. It's amazing that Rcahel is pedaling because only a month ago a drunk driver struck her while she was bicycling outside Fort Lauderdale. She suffered a concussion because she wasn't wearing a bicycle helmet. And her Peugot bicycle was wrecked. 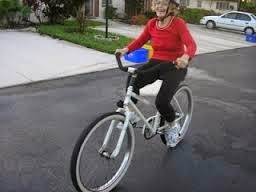 I told her to never hop on her new bicycle -- a nice Jamis touring machine -- ever without a helmet. I think she learned that lesson. Most of her wounds have healed and she's back in action. She was at the Dundee Library because that's where her boyfriend sent a pair of pannier bags. She already sent home two boxes worth of stuff and was trying to light up the load in her trailer-cart by shifting some gear to the pannier bags. But she had difficulty fixing a flat, so I stopped by to lend a hand and find out about her odyssey. The assistant librarian at the Dundee library got such a kick out of Rachel that she just had to get a photo of her and her rig. I thought I'd bike about 10 to 12 miles with Rachel on US 27. In the Dundee stretch on US 27, we have to be careful because there's no shoulder with a big road-widening project going on. After we got by the construction zone, we had a pretty good shoulder to bike on. That's a long line of gear. Rachel's guitar is wrapped in plastic and tucked deep inside the load on the trailer-cart. Rachel is using her mat to tell folks that her 30 CDs she's hauling are for sale. There's the official tour sign -- plus with a loaf of bread. Good luck Rachel! 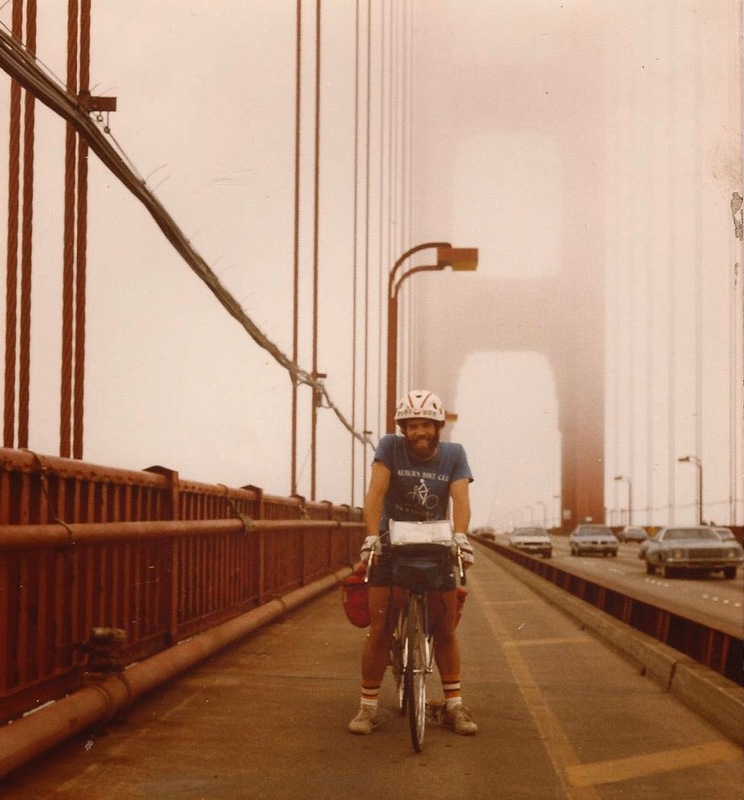 I biked twice across the country solo, so I know what it's like to be on the road between towns and cycling miles and miles every day. It's all about keeping the faith and letting the days unfold naturally and going with the flow. Rachel's says her next performance will be in Gainesville. Today the Tour de Spring Training arrived in Winter Haven, where the Cleveland Indians played their last game at their spring ballyard here in the middle of Polk County. The Indians' ballpark is a small bandbox of quirkiness, but not much space for cool money-making amenities. So, the Indians are off to Arizona. At Chain of Lakes Park, no other Cleveland Indians player is more recognizable than the great Hall of Famer Bob Feller. Here he is leaving the ballpark in uniform, getting in his car and heading to his condo for a rest between autograph sessions. Check out Bob Feller's hand-written words on the sign. Last time the Indians player flags will wave in Winter Haven. Your final lineups at the Indians' ballyard. Some spring stadiums won't let you leave and come back but not the Indians' ball yard, where the ushers were stamping the folks to allow them to return. Slim pickens in the Indians store. On a nearby field, some prospects are hoping to make the bigs one day while a few fans catch the action. Again another stadium with not much bicycle parking. 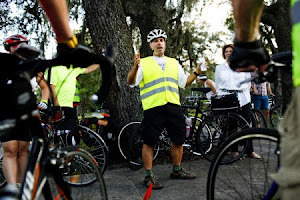 Every year Florida has the highest per capita rate of bicyclist fatalities and regrettably and tragically another bicyclist died here in the Tampa Bay area. 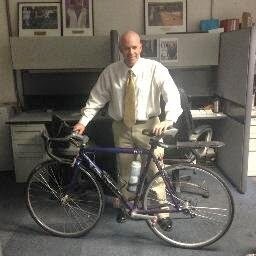 Tonight I saw a TV commercial that made fun of a guy who switched to a bicycle to commute to work because of the high price of gas. They put him in a goofy outfit and had another person mock him. That's the type of popular culture crap we have to have to reverse. 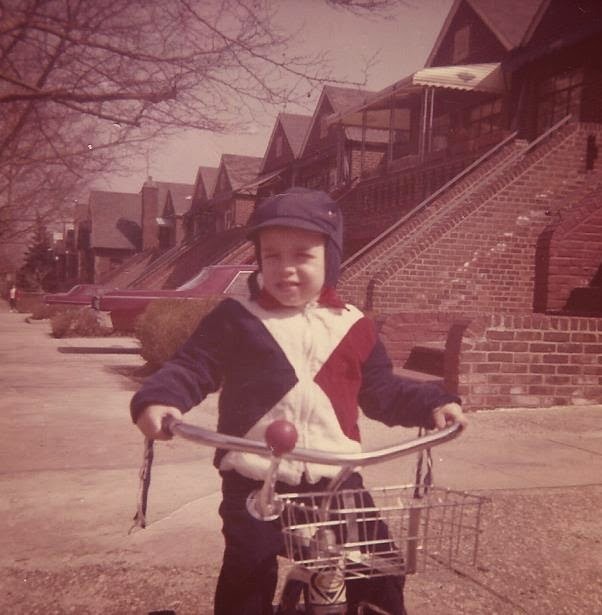 It's why I write this blog -- to show the beauty of cycling through life.